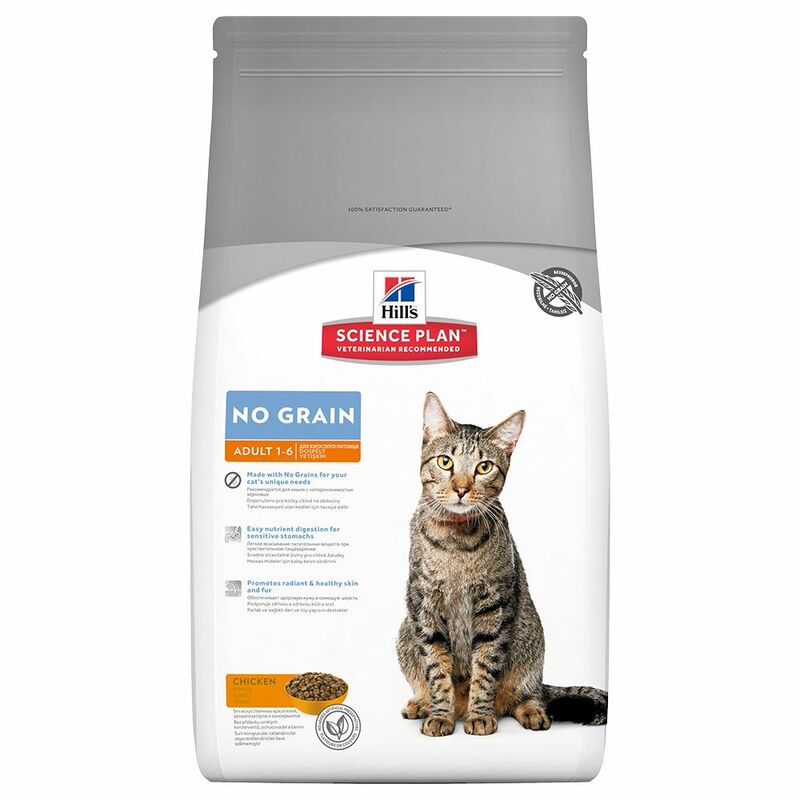 Hills Science Plan Feline Adult No Grain - Chicken dry kibble is often recommended by vets as it contains perfectly balanced amounts of energy, protein, vitamins and minerals. The recipe is tailored to the needs of adult cats aged 1-6 years, with 28% chicken, plus turkey, vegetables, plant extracts and a wealth of eΒential nutrients. The recipe is very easy for your cat to digest, thanks to the lean, healthy protein from chicken and turkey, as well as the grain-free formulation. The recipe is also free from artificial flavourings, aromas and colourings, making the dry cat food very well accepted, even for animals with sensitivities or allergies. This dry kibble for cats also includes natural prebiotics, to support your cat's digestion. Fibre from beet pulp and flax seed promote a balanced gut flora and also support optimal absorption of nutrients. Unsaturated Omega-3 and Omega-6 fatty acids are eΒential for healthy skin and a shiny coat, whilst the high antioxidant content helps to boost your cat's immune system and combats free radicals. This tasty dry cat nutrition supplies your cat with all of the nutrients that it needs to live a healthy, active life. Hills Science Plan Feline Adult No Grain - Chicken at a glance: Complete and balanced dry food for adult cats aged 1-6 years Grain free and gluten free recipe, suitable for cats with allergies or food intolerances Balanced with ideally adjusted nutrient levels: balanced amounts of protein, energy, vitamins and minerals 28% chicken: lean, tasty animal proteins Easy to digest, even for sensitive tummies: healthy ingredients combined with natural prebiotics (fibre from beet pulp and flaxseed) help to balance intestinal activity and promote good nutrient absorption Healthy skin and shiny coat: rich in unsaturated Omega-3 and Omega-6 fatty acids Antioxidants: support overall health, help to improve the immune system, and protect cells against attack from free radicals No artificial colourings, flavourings or preservatives.